I've only met Joseph Kanon once--at a book festival in Palm Springs, California (which is either a city with a golf course problem or a golf course with a city problem)--but we instantly bonded and became good friends. Or maybe that's just me; if you stopped him on the street today and showed him my picture, he probably wouldn't have the faintest idea who I was. But for one evening in Palm Springs, it felt like we were BFFs. Mr. Kanon (“Oh, please! Call me Joe!”) is such a genial, loquacious personality that I was immediately drawn in and put at ease by his sincerity and warmth. Mr. Kan--Joe and I shared tiny plates of food during an evening party at the Sunnylands estate after a book reading which was part of the Rancho Mirage Writers Festival. Owned by Walter Annenberg, a philanthropist, ambassador and publisher (he founded both TV Guide and Seventeen), the palatial Sunnylands is informally known as the Presidential Retreat. Most of the Republican presidents since Nixon have slept there. The Annenbergs died years ago, so it was okay for President Obama to sleep overnight there a few months before Joe and I attended the dinner party. There’s a mid-size room just off the master bedroom where the flat surface of every piece of furniture is crowded with framed photos of the Annenbergs shaking hands with Eisenhower, Nixon, Ford, Reagan, Bush I, and Bush II. Another whole wall is devoted solely to Christmas cards from Queen Elizabeth (there must have been at least 40 of them). When I wandered out to the terrace, lit by gas-fed tiki torches, I found tables mounded with food: five kinds of cheese, artisanal ham, lamb chops, berries, arugula salad. Serving staff circulated with trays of canapés and hors d’ouevres: “Would you like an herb shrimp crostini with mango salsa, sir?” I stood at one of the small, chest-high tables, forking down salad, gulping white wine and starting to hyperventilate like a fish out of water. I've never been good at social settings; cocktail parties give me the prickly hives. But then my nervous solitude was interrupted by a “May we join you?” I glanced up from my lollipop-sized lamb chop to see a tall, distinguished-looking gentlemen and his wife holding drinks and plates of food in their hands. “Certainly!” I said. He set down his plate, extended his hand, and said, “I'm Joe and this is Robin.” Of course, I recognized him as the Edgar Award winner of novels like Los Alamos, The Good German and Istanbul Passage. And of course I was intimidated by my impression of this guy who'd hopped around the globe on jets and lunched with glitterati like George Clooney. The best-selling author immediately put me at ease by drawing me into conversation: “Isn't this food exquisite? And what did you think of the artwork inside the house? Is this your first time in Palm Springs? Are you having a good time?” And we were off, dashing through a maze of chatter and gossip which lasted nearly half an hour and ranged across so many topics I can't remember them all now. What I do know is that Joe Kanon struck me as someone with an encyclopedic knowledge who would give any Jeopardy! champion a run for his money. Alex Meier, a young Jewish writer, fled the Nazis for America before the war. But the politics of his youth have now put him in the crosshairs of the McCarthy witch-hunts. Faced with deportation and the loss of his family, he makes a desperate bargain with the fledgling CIA: he will earn his way back to America by acting as their agent in his native Berlin. But almost from the start things go fatally wrong. A kidnapping misfires, an East German agent is killed, and Alex finds himself a wanted man. Worse, he discovers his real assignment—to spy on the woman he left behind, the only woman he has ever loved. Changing sides in Berlin is as easy as crossing a sector border. But where do we draw the lines of our moral boundaries? As Kanon notes in the trailer, “Occupied Berlin was a city made for spies,” and complicated, haunted cities like this were made for kind, smart, engaging raconteurs like Kanon. 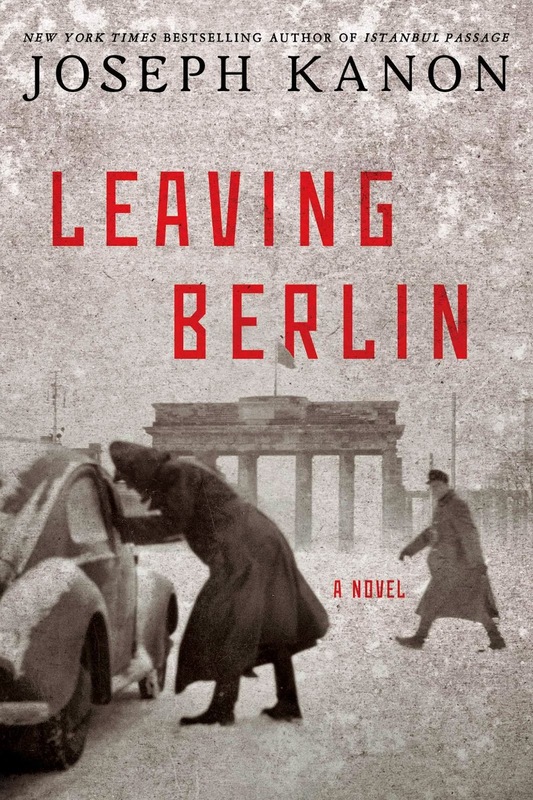 I'm putting Leaving Berlin near the top of my 2015 reading list. I think I'll pair it with a glass of Riesling and a shrimp crostini with mango salsa in honor of our brief encounter in Palm Springs. I'm so happy to read this post! Joseph Kanon is one of my favorite authors. I own all his books. And I'm so jealous that you got to meet him. I've talked to him by email several times and told him I'd love to meet him, but he never comes to Michigan. :-( Maybe he'll come someplace in the midwest. If I know about it early enough, my husband and I can make it a minivacation.